In Loreto there are 5 different islands, one of them in Danzante Island, according to myths and legends, the name of the island “Danzante” was born when the Jesuits arrived at this place and observed that at that time the native tribes of Loreto such as the Guaycuras, Cochimíes and Pericúes performed dance rites on this island, because in offering to their Gods to have abundant rains in their lands and probably thus maintain their prosperity. Furthermore in Danzante Island maybe you can swim in 3 different beachs, first of all, “Honey moon” beach is the most of all beaches is amazing and beautiful, also you can find “Bahia Onda” beach is perfect and clean, and you can find it in another side of the Danzante Island. Also, Danzante Island has an area of approximately 4.64 square km, is located south of Loreto and is 2.61 km from the coast of Puerto Escondido, conclude hence you can access it from Puerto Escondido, Ligui or Ensenada Blanca preferably, as a result than approximate time of transfer to this island It is 20 minutes, so it is protected by the “Bay of Loreto National Park” and therefore it is accessed with permission and recommendations, so it is preferable to do it with companies that provide this tourist service, it is a great place to practice, diving, kayaking, hiking, paddle boarding, snorkeling and all these services you can easily get them here on www.loreto.com , it is worth mentioning that to do camping or fishing is forbidden to reserve permits provided by “The National Park Bay of Loreto”. And the most noteworthy, Danzante island is made up of a great variety of flora and fauna and it is worth mentioning that it has endemic species, furthermore the flora and fauna of Isla Danzante is very similar to those found in the peninsula, it has approximately 16 different reptile species and Like the other Loreto Islands, and especially emphasize they were the result of erosion and faulting and their geological features are volcanic, their relief is very dominated by the “Sierra de la Giganta” in Loreto. In conclusion, during your visit to Danzante Island you can find along the way a lot of shows by marine fauna such as Humpback Whales, Blue Whales, Orcas and dolphins during their season, you can also see a great combination of turquoise waters with desert. 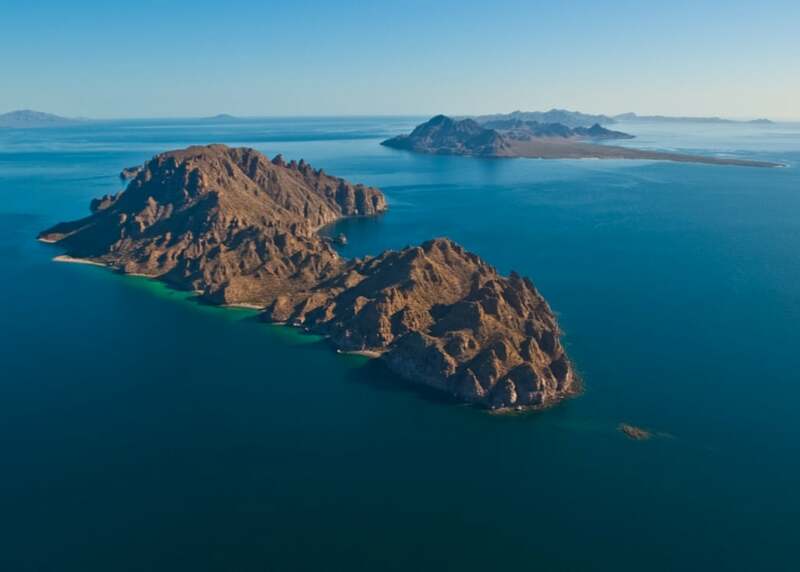 Today the island is uninhabitable thanks to the protection of the National Park “Bahia de Loreto” and is one of the tourist spots most visited by tourists where they can do many activities or just enjoy a day at the beach, always keeping this place clean. Loreto, Baja California Sur, Mexico. • Take security measures prior to the visit. • Have a company that knows the site since going in a personal way can be somewhat inconvenient. • Respect the site and its natural resources. • Avoid Pollution of this beautiful Place. • Report to the authorities any type of damage that this area presents. • Download the mobile application “WIKILOC” in this you will find the route we made for you. Within Wikiloc, create your account, look for the route as “Isla Danzante, Loreto, BCS.”, Visualize it and go. In Google Earth you can also visualize the route in Orange color. Click on image to see the rout. What Should you take to Danzante Island?